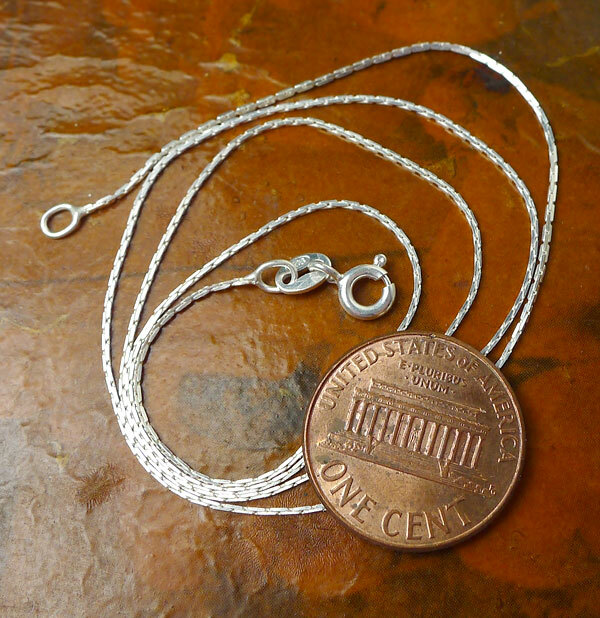 Pendant measurements do not include the length of any removable attachments. These will vary some, but a standard jump ring would add about 4mm (~1/8") onto the overall length. The Pentagram dates back thousands of years to pre-Babylonian Sumer (~3500 BCE). Many religions have once used this symbol ... the Jewish people saw it as a symbol of the Five Books of Moses, and Christians once used it as a protective amulet. It has been called such things as the Druid's Foot and the Witches' Star. 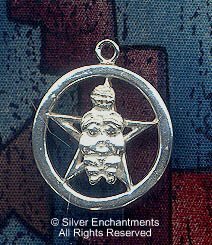 The Pentacle is simply a pentagram (star) with a circle around it. It emphasizes the inter-connectivity of all of the elements. The direct and indirect relation of one element to the other. Traditionally, each of the five angles has been attributed to the five metaphysical elements of the ancients: Earth, Fire, Water, Air & Spirit. Venus of Willendorf - Earth Goddess | Fertility Goddess Symbolism - The Venus of Willendorf is considered one of the oldest depictions of the Great Earth Fertility Goddess. Dated between 30,000 and 25,000 BC, The 'Venus of Willendorf' is the name that was given to a female figurine that was found in 1908 by an archeologist named Joseph Szombathy in a Aurignacian loess deposit near the town of Willendorf in Austria. This statue is an important icon of prehistory. Archeologists have suggested many different ways of understanding its significance for the nomadic society which made it. The first suggestion is that it was a "Venus figure" or "Goddess," used as a symbol of fertility. Apart from being female, the statue has an enlarged stomach and breasts, its pubic area is greatly emphasized, probably serving as a representative of pro-creativity, and the red ochre pigment covering it has been thought to symbolize or serve as menstrual blood seen as a life giving agent. The second suggestion is that the figurine may have served as a good luck charm. Its diminutive size led archaeologists to assume that it may have been carried by the men during their hunting missions in which it served not only as a reminder of their mate back at home but also as a charm to bring them success in their hunting. This is further strengthened by the facelessness of the figurine giving it an air of mystery and anonymity which suggests that it may have been of more importance as an object rather than as a person. Also, the figurine's hair is braided in seven concentric circles, seven in later times being regarded as a magick number used to bring about good luck. A third possible significance put forth is that of the figurine serving as a mother goddess (earth mother or female deity). This comes from a suggestion that the statue was a woman whose specialness was indicated in her obesity since women in a hunter gatherer society would probably not have had the opportunity to get as obese. With all the suggestions that have been put forward about the significance of the sculpture, tentative conclusions can be made about the social, political and religious beliefs of the foraging society in which it was found. The use of the figurine as a deity suggests the practice of religious ceremonies to ensure the success of the tribe. As an earth goddess, it may have played the role of ensuring a continuous supply of food in the society. Along with this comes a possible belief in magic if the figurine was intended to ensure hunting success. Politically, it can be speculated that women due to their nurturing capabilities might have had an esteem role in the society. The society may have thus been more matriarchal rather than patriarchal as suggested by Jacob Bachojen (1815-1887), "Matriachate or gynaecocracy found among tribal peoples, where authority in both the family and the tribe was in the hands of the women, was to be associated with the worship of a supreme female earth deity". Witcombe, Christopher L.C.E. Stone Age Women: "The Venus of Willendorf".